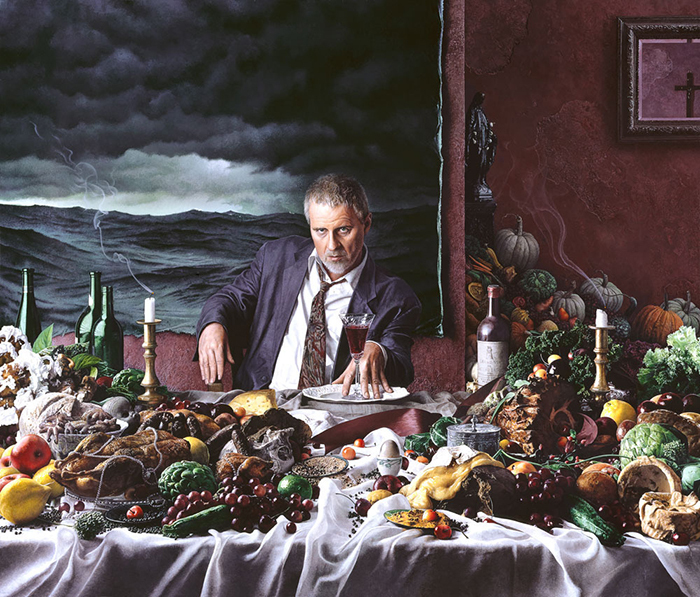 Self-Portrait with Wine Glass (Gluttony) by Kent Bellows, 2000. Medium and size of the original work: Acrylic on panel, 29 ¾ x 35 in. Large (image size 24 ½ x 29 in) $185. Small (image size 7 x 8 ¼ in.) $50. Prints are made to order. Please allow 1-2 weeks for delivery. Kent Bellows has been recognized as one of America’s greatest masters of Realism since first exhibiting in New York in 1985. The Nebraska-born artist, whose father was a commercial artist and watercolorist, began his career as a free-lance science fiction illustrator in the late 1970s for publications such as Omni and Rolling Stone. He had moved into commissioned portraiture and then figurative realism by the early 1980s, reaching national acclaim when he was discovered by the New York art market through Tatistcheff Gallery and then later Forum Gallery in New York. All proceeds benefit Joslyn Art Museum’s Kent Bellows Mentoring Program.